There’s a good chance you’ve never noticed Thai Thai Cuisine, a hidden jewel located in a small business complex near a large housing development. Once you discover it, though, you’ll be glad you did. Inconspicuous proprietor Jirawan Pavapotago prepares bona fide provisions from her native Thailand. 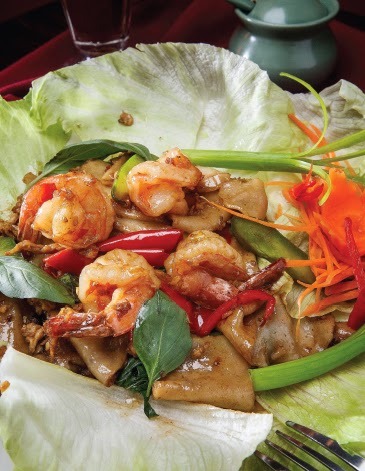 House specialties like pad Thai, pineapple fried rice and drunken noodle (stir-fried wide rice noodles with egg, onion, carrots, red bell peppers and basil leaves) are all dished up with aplomb. Using a variety of ingredients like cardamom, shallots, lemon grass and turmeric, dishes are prepared in varying degrees of spiciness depending on the patron’s preference. At night, consider a chef special like the roasted duck curry or sweet chili fish with choice of tilapia, flounder or whole snapper topped with pineapple chunks, cashews and a toothsome chili sauce. Be sure to try a refreshing Thai iced tea with your meal. The restaurant’s modest dining room features elephant-themed wall hangings and seating for about two dozen guests. Table service is consistently graceful and efficient. Thai Thai is open for lunch each weekday and dinner seven days a week. And here’s a no-extra-charge bonus tip: A $5.99 weekday lunch special is among the best deals in the area. I appreciate your reviews. It would be helpful if you also posted the location, website, sample prices, and current hours of operation. cheap ray bans uk cheap grabbed the thief cheap ray bans uk by the collar, staring eyes, a fiercely flashed, the thief heart was cheap ray ban sunglasses uk shocked. cheap ray bans uk Who stole the wallet, and you stole my wallet what rogue. Cheap thief was caught with one hand cheap ray bans uk raised up collar, ray ban sunglasses cheap uk feet off the ground, more panic.